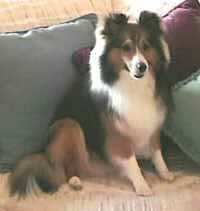 This is a simple page dedicated to my Sheltie, Kelsey. LEFT 8 Months: Starting to become a pretty little lady. This is my favorite picture of her as a puppy. BELOW 11 Months: Looking like a Sheltie at last. LEFT: 13 Months, 13 inches and 13 lbs. Kelsey is a typical Sheltie, in that she is unique. She is not afraid of anything except big dogs. She loves the vacuum cleaner, hair dryer and jumping in the bathtub. She barks at big dogs but only when she is standing between my legs. She loves our two Schnauzers and considers them to be her personal chew-toys. They have given up trying to establish dominance over her because she thinks it's all play and they get very disgusted when she won't take them seriously. She is the fetch dog I always wanted and loves to play tug. When she wins at tug she immediately puts the toy back in my hand or if she is playing with the other dogs, back in their mouth. She thinks that cats make wonderful sheep. She knows our routines and tries to anticipate what we are about to do. If we get our morning routine wrong, she barks at us. TECH NOTE: The pictures on this page were created primarily with a video camera and a Snappy video capture device.The video camera is a Sony Hi-8 camcorder and I try to use direct camera to Snappy hookups when I can. I can also use video tapes and capture a single frame, but I do lose some quality. The picture to the left is a capture from video tape. Yes, that is my real license plate. I was thinking of painting the car tan and the hood white, but my wife didn't think that was a good idea. The 13 month photo is a scan of a picture we had made by a local professional photographer. Most of the pictures started out at several megabytes each, but by cropping and converting to medium quality JPEG pictures, they are now reasonably sized at 6-18 KB. I will be adding some earlier photos soon, but they will all have to be from video tape because I didn't have the Snappy at the time. Here is a recent picture of Kelsey, hard at work. Kelsey has become a very sweet little dog, her personality matches her looks. 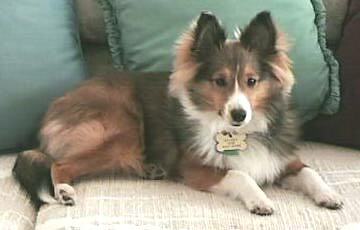 Visit some of the Foster Shelties we have had the pleasure of knowing. Visit the whole Armstrong Family, including non-Shelties and humans. Visit our new web page for Montana Pets on the Net. 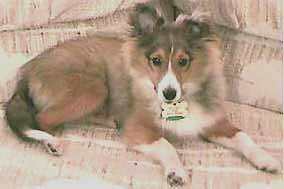 If you have stumbled into this page and would like to know more about Shelties, please vist Mary Jo Sminkey's Sheltie Page. 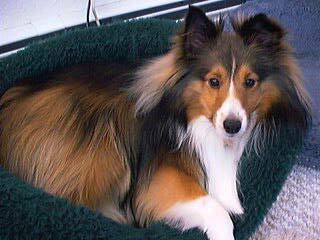 This is a great resource for all things Sheltie, and a lot of fun too! 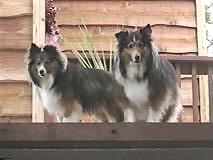 Lots of pictures and information and links to just about any Sheltie resource you want. For those that didn't stumble into this page, you can go too, but then you have probably already been there! 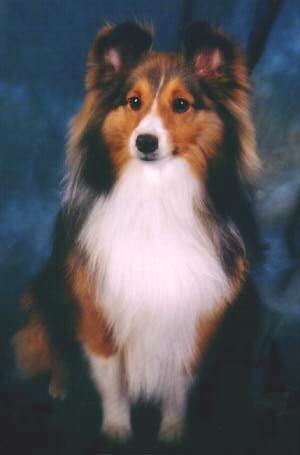 If you are really interested in Shelties, I recommend spending some time on the Sheltie List. 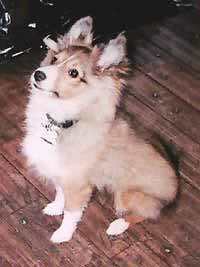 You can get information about the Sheltie list at sheltiehomepage.mcf.com/ It would be hard to find a nicer group of people anywhere on the Internet (or anywhere else). This is a good place to ask questions about what to look for in a puppy or a new dog, how to take care of it, and what to do when things go wrong.